1) The Bush administration finally lost patience with the KMT's politically-motivated stonewalling of the special arms bill back in October, and let the Taiwanese public know it. Exposing the KMT's deliberate efforts to weaken the nation's defense against Chinese aggression? How dare Bush interfere in Taiwan's internal politics like that! 2) The Bush administration refused to call for Taiwan's independence-minded president to step down in the face of corruption charges back in September. Remember that outrage over Bush's interference in Taiwan's internal affairs? Well, stop remembering. Because when the KMT wills it, it's Bush's DUTY to interfere! 4) The Bush administration on Friday granted President Chen transit stops in LA and San Francisco for Chen's upcoming trip to Central America. No, no, no - that'll never do. Doesn't Bush know that the KMT's ideological enemies must always be snubbed with transit stop offers in far-off places like Alaska? "Bush Grants Chen January Transit Stop...In Alaska." That's the headline punchline the KMT was REALLY hoping for. In the final analysis, the China Post has decided if George Bush isn't WITH the KMT, he must be AGAINST it. And that's the reason they've decided to hop onto the bandwagon. * A KMT newspaper telling its readers, "Better red than dead?" As Yogi Berra would say: If Chiang Kai-shek were alive, he'd be spinning in his grave. Really? From the looks of this video, not ALL the Muslim world. My favorite part is when the Saddam defender informs us that his brother was murdered by Saddam, but Saddam is still his idol. Talk about licking the boot that kicks you. Very interesting. Call me a worrywart, but I fear that the "Taiwan issue" will come to a head sometime after the 2008 Olympics. 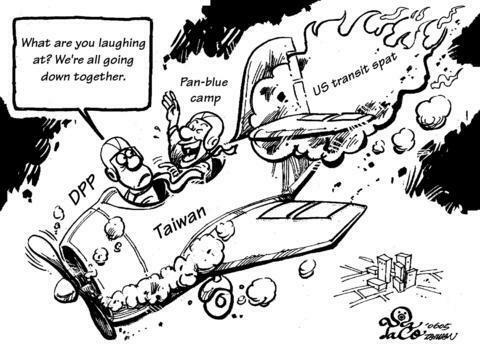 Certainly the PRC wants to get Taiwan back peacefully, but I fear they could use force if they don't get their way. The issue, of course, is whether the US will come to Taiwan's aid. If it is perceived that either A) Taiwan provoked the crisis, or B) Was laggardly in buying weapons to defend itself, then it will be hard for a US president to risk American aircraft carriers. Regarding point A you made, we can always count on China to provide a reason, fictitious or otherwise, for an attack. It's up to policy makers to think about what in this case constitutes a real provocation, and what instead constitutes a flimsy pretext. Giving an example from another part of the world: Iraq had a few legitimate grievances with Kuwait back in '91, but none of those grievances justified the conquest and outright annexation of a sovereign country. As for point B, absolutely. And if push ever comes to shove over here, it won't just be American knee-jerk pacifists making that argument, either.